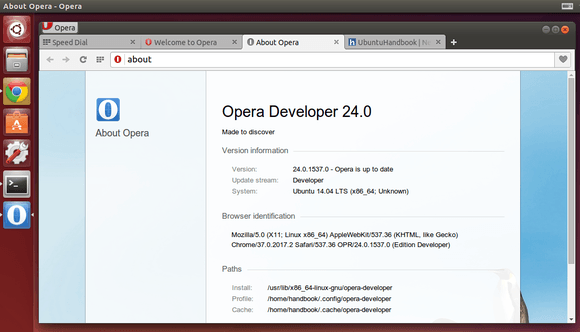 Opera 24 for Linux, the first Chromium-based build, was finally released today on June 23, 2014, as part of the ‘developer stream’. It has been almost one year since Opera released version 12.16 for Linux in July 2013. Vastly improved Speed Dial and Opera Turbo. Click to install the package via Ubuntu Software Center. During the installing process, it will add the Opera repository into your system so that you can receive future updates by running regular Ubuntu updates via Software Updater. Also, it will install the Pepper Flash Plugin to get flash working. 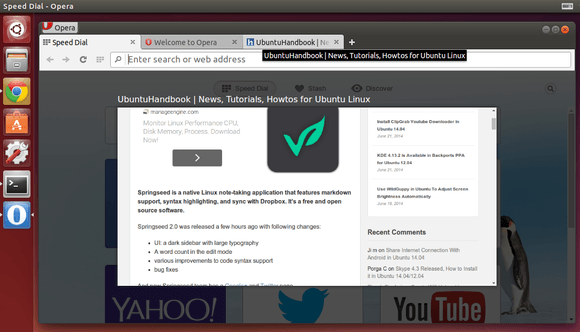 I’ve installed Opera 24 on my 64-bit Ubuntu 14.04 laptop, but it does not launch due to permissions issue (might be).